Address: 2011 NW Myhre Rd. The Doctors Clinic is currently seeking a board eligible/board certified Allergy & Immunology physician to join our team of healthcare professionals at Cavalon Place, located just west of Seattle, in beautiful Silverdale, Washington. Located on the Kitsap Peninsula, just west of Seattle, Washington, The Doctors Clinic is built on a history of medical excellence and compassionate care. For over 70 years, we’ve cared for the people and communities in Kitsap County, population ~270,000. Today, with ~75 healthcare professionals and approximately 325 supportive staff, The Doctors Clinic remains a physician-owned, physician-governed multi-specialty group with 7 patient care clinics representing a broad spectrum of practice specialties including primary care, surgery, specialists and sub-specialists. Our positive, collegial environment embraces respect, communication and diversity. As a leader in quality health care and a major employer, The Doctors Clinic seeks individuals who share in our mission of Excellence in Patient Care. The beautiful Kitsap Peninsula is situated between the majestic snow-capped Cascade and Olympic mountain ranges in Western Washington. It sits directly across the Puget Sound from Seattle, and serves as the gateway to the spectacular Olympic Peninsula. The geographic area contains more than 250 miles of shoreline, and is rich with year-round recreational opportunities; golf, hiking, biking, camping, rock climbing, fishing, sailing, boating, kayaking, diving, and easy access to snow skiing and other winter sports. Local, regional and national attention has focused on the high-quality living in the Kitsap community. The schools, medical facilities, shops, restaurants, services and warm-hearted generous people are equally impressive. Located just east of Kitsap County, Seattle is a short ferry boat ride across the Puget Sound, or an easy accessible drive south over the Tacoma Narrows Bridge. Whether you go to Seattle or Tacoma, these are choice destinations for big city amenities; professional sports, cultural events, symphonies, shopping, fine dining, concerts, live theater, historic landmarks and other interesting attractions. With boundless outdoor recreational activities, unspoiled scenic beauty, access to cultural amenities, and warm and friendly communities, it’s easy to see how Kitsap has earned it accolades. No wonder so many people want to live, work and play here! 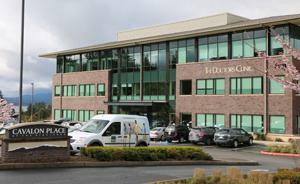 Harrison Medical Center is a not-for-profit hospital and the region’s largest medical center, with three campuses serving Kitsap, Mason, and Jefferson counties. With more than 450 physicians representing 40 specialties, they offer medical and surgical services and 24-hour emergency care in Bremerton and Silverdale. Harrison's Emergency Department is a Level III trauma center.